FedEx employees and local officials at the ribbon cutting for the company’s new distribution center off Route 130 in Hamilton Township, Mercer County. 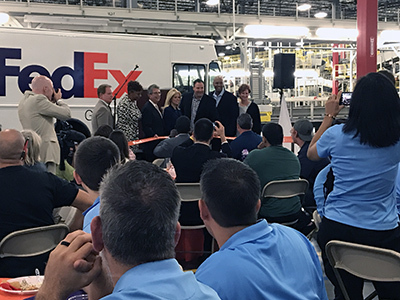 FedEx Ground celebrated the grand opening of a 340,000-square-foot distribution center in Hamilton Township today, part of the multinational courier company’s ongoing expansion plan that has resulted in 16 additional major distribution centers since 2005. The new facility, which opened last month, employs 280 workers, Federal Express stated in a press release. There will be room to add more positions as demand grows, the company said. The new FedEx station is fully automated and will boost daily package volume capacity and further enhance the speed and service capabilities of the company’s ground network. The station’s processing rate is 15,000 packages per hour.